For the second year in a row, President Trump’s budget calls for Amtrak funding to be cut in half. This year’s budget again asks to cut funding from the current $1.495 billion to $738 million in FY19. And though the math is the same, the Administration’s goals have apparently changed. Last year’s budget simply called for eliminating long-distance trains all together, while this year’s budget proposes that States cover the cost of long-distance routes. It’s not hard to see potential problems with asking many conservative states in the middle of the country to pay hundreds of millions of dollars to Amtrak. Traditionally, this is why we have a federal government: to provide and invest in public services like interstate passenger rail service. It’s also just not how passenger railroads work. Let’s suppose that Montana decided it didn’t want to pay for Amtrak, and therefore Amtrak decides not to stop there. It saves Amtrak little-to-no money by not stopping, since it still has to pay costs for fuel, crews, and track to travel through. It also undermines service quality because they wouldn’t pick up or drop off any passengers in Montana. 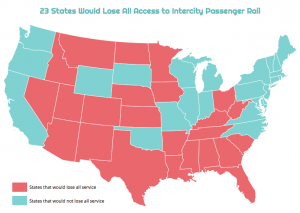 And again, unlike airplanes, Amtrak trains are already traveling through the state, so it’s silly to set up a system in which States can simply opt out. Amtrak long-distance trains employ thousands of TCU members, all of whom know firsthand how vital the service is that Amtrak provides. If Amtrak’s long-distance service were eliminated, thousands could lose their jobs, while 220 communities would lose a primary transportation service. 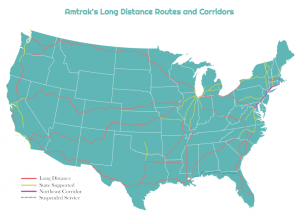 The post Trump budget guts Amtrak long distance…again appeared first on IAMAW .